Can you guess where this review is going to go? 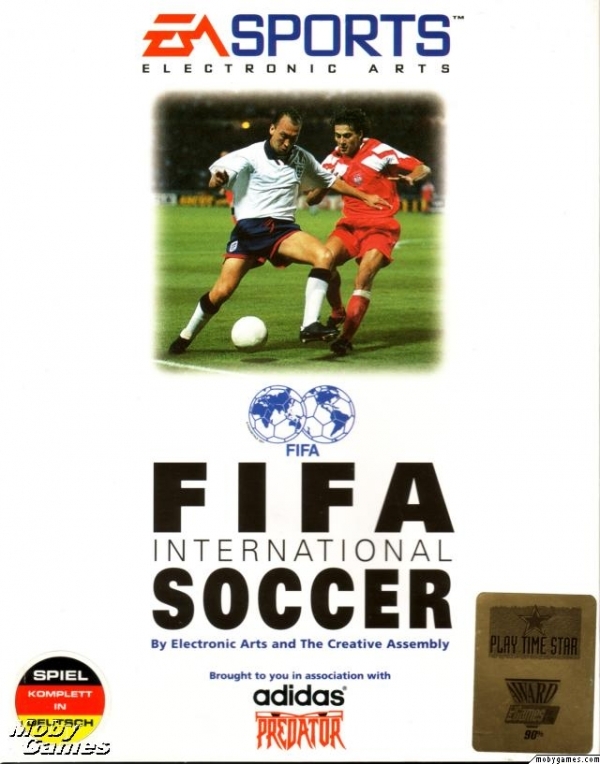 The game is officially called FIFA International Soccer, in some circles it is known as FIFA 94. But for clarity this is being called FIFA1, for reasons that will become apparent after we review more FIFA games. This is where it all started, this game spawned a behemoth that will never stop, it is a series that has effectively killed decent FOOTBALL games, and it is why we are not likely to see a Fever Pitch, a Super Kick Off, or even a Sensible Soccer game again. So, right off the bat. The music is TERRIBLE. I mentioned in the Destruction Derby review that the music was “Generic 90s game dance music”, the turgid noise in FIFA is below that. It is terrible. Go have a listen, just for curiositysakes, and is the new holder of the “Skrillex generic beeps and bleeps wub-step award”. I know this is the first entry in a seires, and it is a megadrive game, but man… IT IS FUGLY. They look very ropy and it gets worse, you will have a headache after FOUR MINUTES of playing! The refresh rate is slow, and everything is delayed. This means it is actually pretty hard to “play dirty”, as when you press a button, nothing happens for a split second. This is kind of a deal breaker in football games for me. If I can’t play a quick one-two, or death lunge somebody who is through one-on-one with the keeper, then there is no point. This leads to an interesting issue, the referee is turned OFF by default. Which means the opposite team play like Millwall. I palyed Germany vs Brazil with the ref turned off. Brazil played like hoodlums! 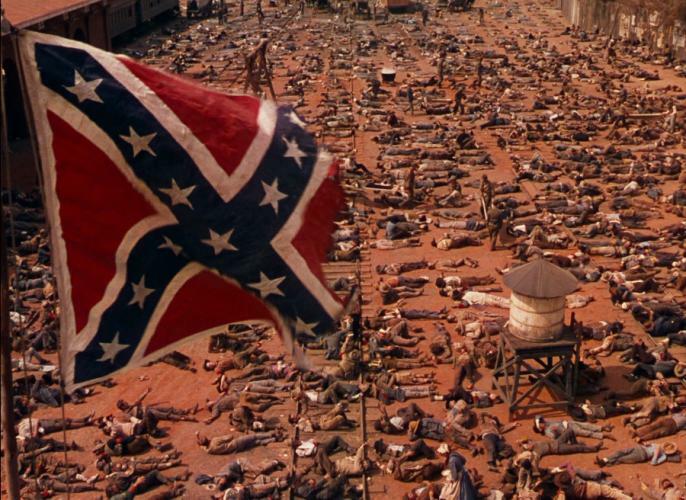 I didn’t manage to get a picture of it, but there was a point where the screen mimicked the “after battle scene” in Gone with the Wind. Ok, I might be exaggerating a “little”, but I did have 6 players down clutching their knees refusing to get up. It makes it even stranger, that when you turn the referee on, the fouling instantly stops. I played 1 match with the ref turned off, and a dozen with him on, all Germany vs Brazil, and in the those matches the opposite team conceded ONE free kick. So we had gone from 30(ish) terrible tackles in one match to 1 foul in 12. However! 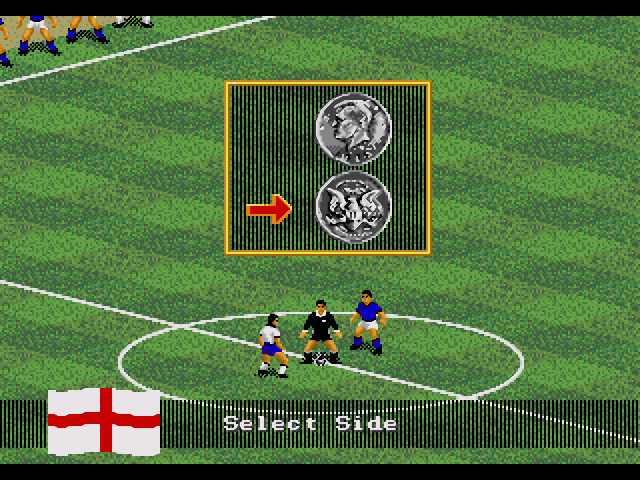 Possibly the BEST feature in a football game ever was introduced (and taken away after this)! You can RUN AWAY FROM THE REFEREE! You heard/read that right. You commit a foul, the ref comes over to give you a ticking off. YOU RUN… And Benny Hill style hilarity ensues (minus the music). I was going to make this video myself, but some genius beat me to it! I mentioned in the Sensible Soccer review that FIFA had “PRESS A” to win mechanic. I was wrong. It isn’t very often I’ll admit it, but it’s true. I was wrong. It has a “PRESS C” to win mechanic. If you press C, the ball will, like a homing missile, GLUE TO YOUR PLAYERS FOOT. A (long pass), and B (short pass) are fiddely, and kind of go where they like. Press C, and your defender will lump it upfield, straight to your striker, from box to box. Then, if you press C and aim for any corner of the goal INSTAGOAL. Now, you can also get INSTAGOAL by standing in front of the keeper as he kicks it. Apparently it is a “bug”, but I would say it is a good feature. Not all the time, you do have to time it right, and be stood at the right angle, it adds a dimension to the game that modern FIFA lacks, and that is danger in mundane positions. It isn’t common, but we can all think of examples where this happens in a real game of football, so small insignificant moment leads to a goal. There are two game modes “Action” or “Simulation”, they play in a similar way, but i did notice a propensity for higher scoring matches in the action matches. Finally, one final thing before we wrap up. One last feature that is actually something I like, and miss from later FIFAs. As you see below, FIFA1 had a titan-tron! It has very limited animation to it, but it was cool, and it worked. Cons: Really slow to play and unresponsive, terrible game music, stupid matches, no fouls, ugly graphics. Sounds like a realistic football game to me, lol. I got the megadrive 3 in 1 too, it doesn’t work though. I’m gutted, really want to play it!